NB This hotel does not accept children under 12yrs because of valuable objects of art on show around the hotel. The Rachmankha is much more than just a hotel. It is an experience. For the owner, who are two of Thailand's most famous designers and architects, it is a creation of love and a treasury of Lanna art and Chinese antiquities, which can be found in every guest room and throughout the hotel. The combination of Lanna art and interior design, and the temple style architecture has created a haven of peace – the kind that penetrates you and touches you heart. This is an ideal hotel for people in need of rest and relaxation. The design of the hotel is taken from the viharn (chapel) of one of Thailand's most beautiful of temples, Wat Phra That Lampang Luang in Lampang province, which is why the hotel look and feels like a temple. The hotel is planned according to ancient principles of Chinese architecture because the architecture and interior designer want the hotel to reflect the Chinese roots of Thai architecture. The interior design is based on northern Thai Lanna culture, which is a of Chinese, Dai, Laotian, Lua, and Burmese culture. This accounts for why the hotel is full of Chinese antiques and exemplifies the art and architectural features of all of these cultures. Altogether, the hotel is a cultural masterpiece. One of the uppermost aims of creating the Rachamankha was to enable tourists to experience – feel and touch – genuine Lanna culture, even though it will take many years to recoup the enormous cost of construction and decoration. No expense has been spared to create this experience, and indeed, many items of Lanna furniture and many of the decorative pieces of Lanna culture were bought in China, Burma and Lao. The Rachamankha has 18 Superior rooms, 4 Deluxe rooms, and 1 two-Bedroom Suite. 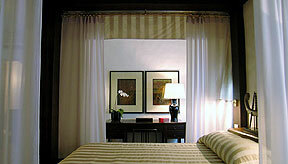 Each guest room is slightly different because the furniture is antique, and each piece is different. The door is an old Lanna style door with an ornate door Handle and wooden bolts. The window blind is made from bamboo, and reeds are used to make the colouful floor matting. The table lamps are made from Chinese porcelain and a Lanna lantern with a tassel that matches the colour of the antique wardrobe hangs down in the centre of the room. 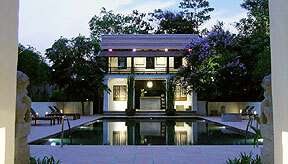 There is also a 20 – meter swimming pool, which is lined with sun beds and bougainvillea flowers. The airy Pool Bar offers snacks and drinks, while the open-air room above provides a massage service. The restaurant is illuminated by large Lanna lanterns, and beautifully decorated with nineteenth century paintings that describe part of the life of Lord Buddha on a large cloth that hangs down from the ceiling. 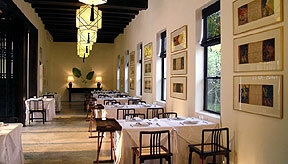 Antique Chinese tables and Ming Dynasty plates are placed tastefully along the sides of the restaurant. The focus of the cuisine is Thai, but there is also a large selection of fusion dishes that combine food, sauces, and flavorings from Thailand, Vietnam, Japan, and Europe. Next to the restaurant there is a small, shady courtyard where gusts can dine outside while listening to old northern Thai music. The Bar is situated next to the restaurant and is decorated with a very rare Chinese antique liqueur screen, and lithographs by Henry Moore, Robert Motherwell, and other early twentieth century painters. The screen shows in gold paint the whole process of tea production from the bush to the ships exporting the packaged tea leaves. 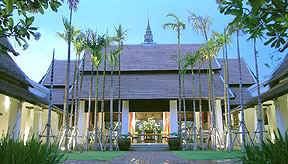 Above the restaurant is the Gallery, which serves to educate guests about Lanna culture, and also to provide a meeting room. It is filled with silverware, lacqueurware, hilltribe jewellery, a sword collection, an eighteenth century Buddha image, and also with the post, plates, etc., that were discovered when the hotel site was excavated. If there are any further details and if you have a second choice of hotel if this one is full, please write in the box. 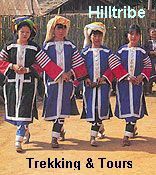 Hilltribe Trekking & Tours - both trekking and tours to see the hilltribe villages in Northern Thailand. 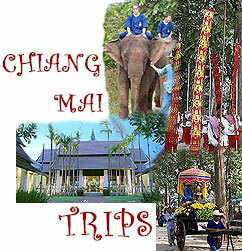 Licensed with the Tourism Authority of Thailand. Special Internet rates for hotels in the North of Thailand. Wayfarers Travel makes every effort to update the information on every hotel. Any errors or omissions are not the responsibility of Wayfarers Travel.